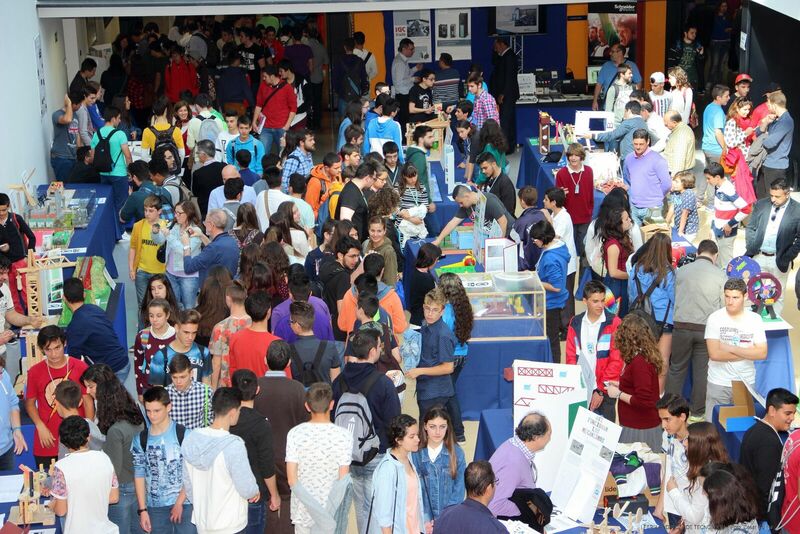 El 20 de mayo de 2016 será la II Feria Andaluza de Tecnología, Robótica, Ciencia e Innovación. Destinada a alumnos de ESO y Bachillerato. Os ponemos algunas fotos y vídeos de la primera edición que resultó todo un éxito con más de 50 centros participantes de toda Andalucía. Ya podéis iros animando y preparando vuestros proyectos de Tecnología en las distintas modalidades de Estructuras, Energía, Electricidad y Electrónica, Robótica o Mecanismos. 2ª Parte. En esta segunda parte van los discursos de las autoridades, reparto de premios y clausura del acto por el Consejero de Educación de la Junta de Andalucia. MUESTRA DE ROBÓTICA, TECNOLOGÍAS E INNOVACIÓN. ROBOTECNO. Organizado por la Asociación de Profesores de Tecnología Andalucía(APTA) y el Parque Tecnológico de Andalucía(PTA). 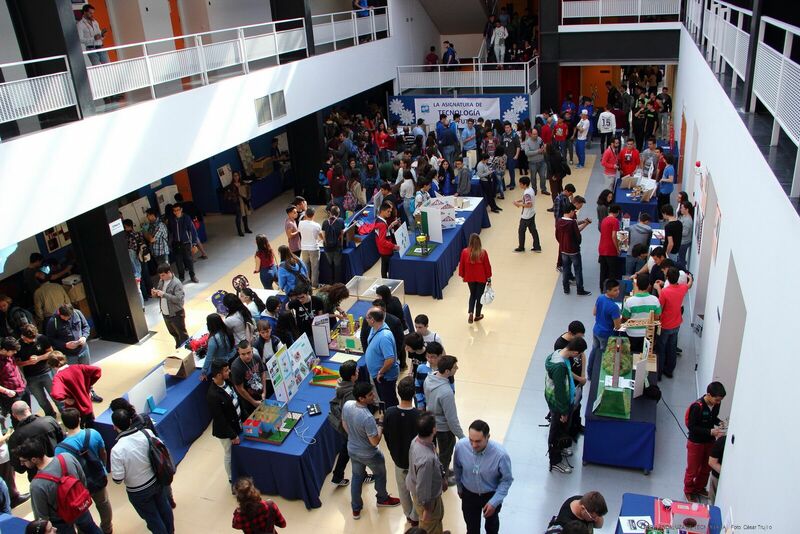 Centros participantes; IES Mª VICTORIA ATENCIA, IES HUELIN, IES TORRE DEL PRADO, IES MAYORAZGO, IES TORRE ATALAYA, IES PLAYAMAR, IES MARTÍN DE ALDEHUELA, IES JARDINES DE PUERTA OSCURA. On 19th October, Breast Cancer Day is commemorated. Breast Cancer care, is a U.K charity providing care, information and support to women affected by breast cancer. 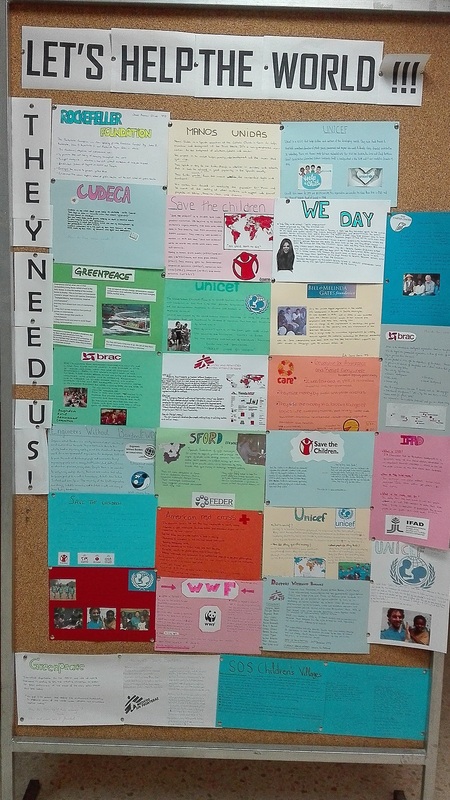 The students in the 4th year ESO bilingual have been working on different charities doing a research on the internet about how to support good causes, fundraising and how the money is used by different GNOs. We finally had an exhibition on the hall about different GNOs in the world. It was a good way of making the students aware of the necessity of helping people in need and the importance of supporting and contributing to the research into deseases like cancer. 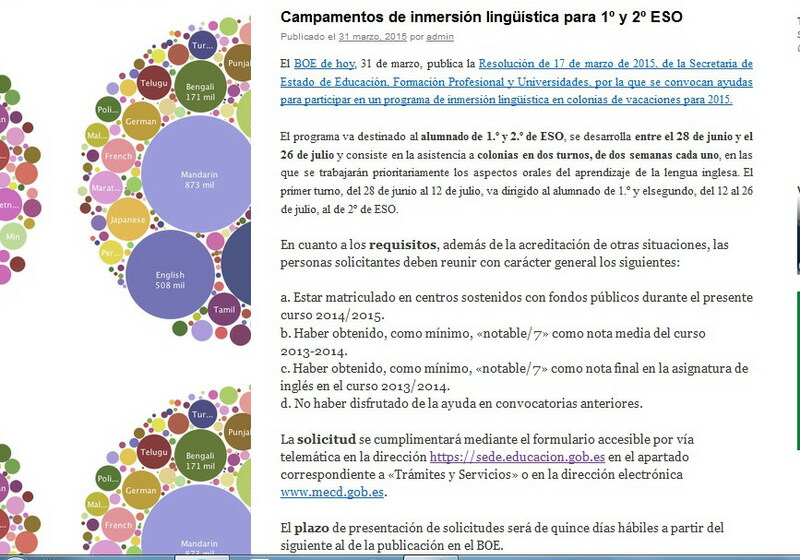 The Department of Complementary and Extracurricular Activities (DACE) is calling for the I Journalistic Writing IES Huelin competition. Its main objective is to promote participation and access for students to the contents of the website of the school as well as developing and improving writing skills and journalistic writing. The best chronicle will be uploaded to the Web with the name of the author and participate in a journalistic writing competition that will be run throughout the year, opting for an award in June. To select a chronicle, both formal quality and appropriateness of content will be taken into account. Correct spelling and grammar as well as conciseness and precision in the use of language will be considered. In terms of content, the piece of news should describe precisely what the activity was about, those involved in it, where and when it took place and how it was carried out. Several pictures of the activity should also be included. All your chronicles published on the school web page will compete for a prize to be delivered at a ceremony held at the school library at the end of the year. A jury of teachers will select the best chronicles of 2015-1016 academic year. We encourage everyone to participate! Headmaster of Boston Science Museum explaining why “Technology” and “Engineering” have to be at school from primary education and how they did to convince education authorities at USA. You can download the Ioannis Miaoulis STEM Speech Transcription in PDF format. 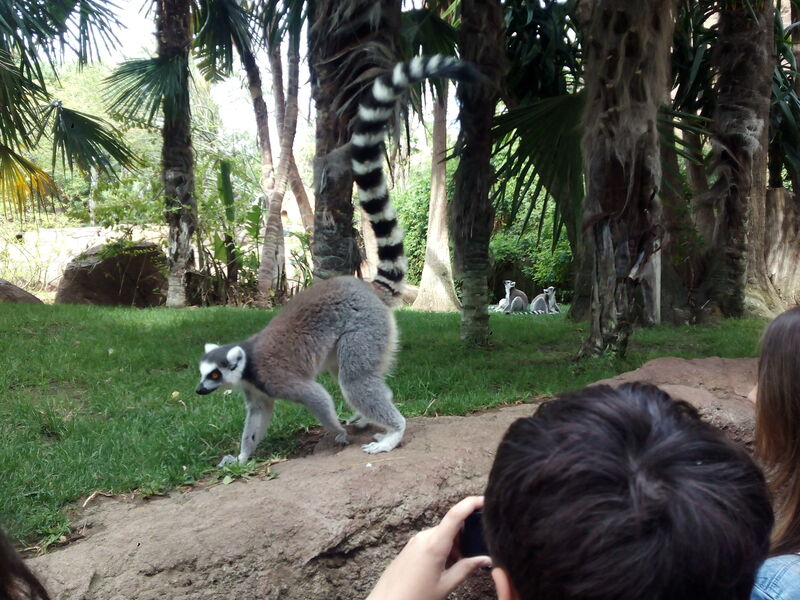 On April 14th First year of ESO visited Bioparc in Fuengirola which represents a different concept of zoo. It is based on respect for nature and the preservation of natural species. The students were able to have a guided tour in English and learn about the different habitats represented in the park. Among the wide variety of animal species they were particularly amazed by the python reticulata (incredibly big! ), the komodo dragon and the Sumatran tigers. Bea, our language assistant, presented the history and implications of genetically modified foods to our 1st of Bachillerato bilingual students.